What I want to call to mind in this sculpture is the four cardinal points. Three of the four forms emerge as strong, geometric elements, representing the diversity, pain and repression of the life of any continent. They rise up slowly and become soft and delicate; two of the forms almost touch in the center in a manner of caressing; the third... giving the impression of protection and security of the life of tomorrow. The fourth form represents a big wave...symbolic of the water that surrounds and unites all the continents. Like the physical suggestion of crossing borders, the sculpture’s life as public art also encapsulates the idea of multiplicities united—Dialogo’s placement outside Pick Hall was a convergence of efforts by University faculty, the Levi administration, Rapson, Albert Pick Jr., and The Polk Brothers Foundation. Dialogo occupies a special place within the University’s architectural history and the public art on campus as one of the only sculptures to come to fruition as a commission for the opening of a new building. The site and building specificity are so strong that Dialogo is considered part of the building itself, so much so that former University Architect Steven Wiesenthal called it “the most attractive quality of Pick Hall.” This type of appreciation for the sculpture as part of its immediate built environment highlights Dialogo’s commission as exemplary of an era when architecture and urban development put a renewed emphasis on the arts—an era that is slowly resurfacing in the 21st century. 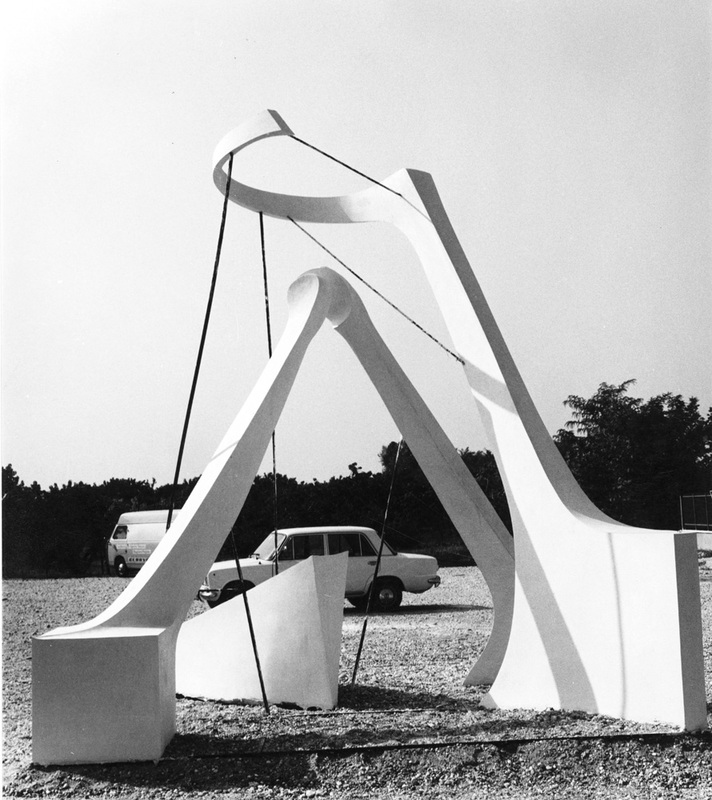 The ease with which Ferrari, just thirty-four years old at the time, brought Dialogo to Pick Hall in just under two years would be unusual in most sculptural commissions around the world today, but the Levi administration’s generous commitment to that moment in the 1960s made a lasting mark on campus public art. 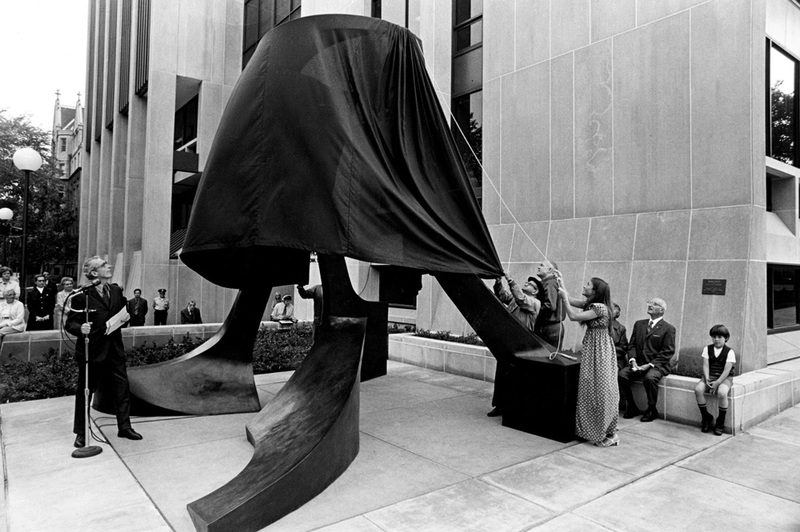 In the face of Pick’s cool exterior, the sculpture to this day embodies the success of the community-minded and interdepartmental camaraderie from its creation, as its elevated limestone bases and flat bronze surfaces consistently function as gathering spots for students and Chicagoans to eat lunch and relax on sunny days. Dialogo’s presence has in fact become so central to University life in the 40 years since its unveiling that it is even an integral part of campus folklore. 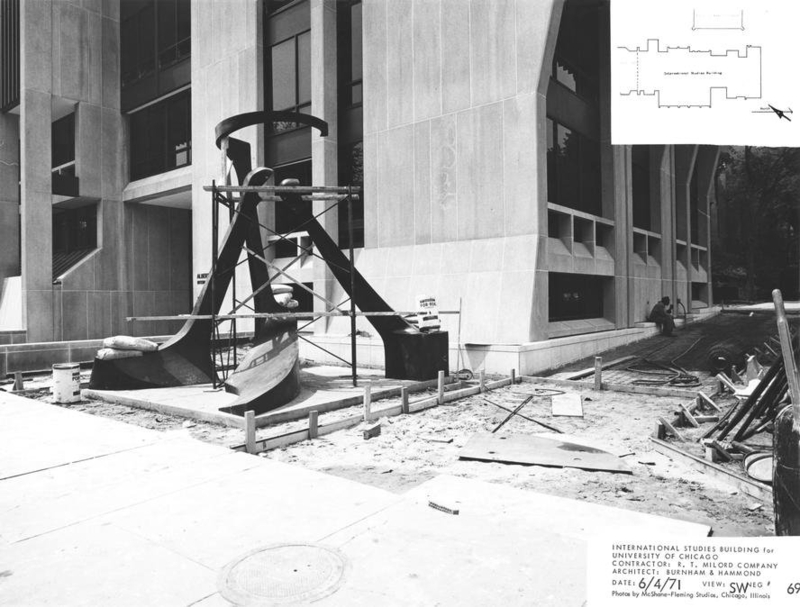 Although the myth was scientifically debunked in 2008 by Will Vaughan, the former head of the Ryerson Astronomical Society, students and faculty alike colloquially know the statue as the “hammer and sickle,” as the sculpture supposedly casts a hammer-and-sickle-shaped shadow on Pick Hall on International Workers Day every year. Ferrari confirmed the shadow was a coincidence in a 2008 Chicago Public Radio interview, but the urban legend captured the imagination so tightly that every May 1st, crowds gather around Dialogo hoping to catch a surreptitious communist message. Though unintended, the myth pleases Ferrari, as the ongoing conversations represent the kinds of exciting, communal experiences art can activate. In a retrospective at the Italian Cultural Center in 1995, he remarked that “the interaction of sculpture with people can give a modern city a human dimension,” and Dialogo’s story does indeed keep people engaged with art in a peculiarly human way. Ultimately, Dialogo’s form is a unifying message in honor of Albert Pick Jr.’s worldly efforts as the former director of the Chicago Council on Foreign Relations. Between its real history and subsequent mythological life, Dialogo—“Dialogue”—lives up to its name as a springboard for campus conversations about institutional values, philosophical ideologies, and the unique impact of public art. Wiesenthal, Steven. Personal Interview. 13 May 2015. Pridmore, J., Kiar, P., & Randel, D. M. (2006). The University of Chicago: An Architectural Tour. New York: Princeton Architectural Press.